Thanksgiving is my favorite holiday. I love it more than Christmas. More than the New Year. And more than Easter too. Thanksgiving isn’t necessarily about giving thanks in my world. You’ll read many posts today about what it is the author is thankful for. Don’t get me wrong. I’m thankful for many things. I’m thankful for my family, my health, my house, my job, my friends… so many more things in greater detail. But this post is about why Thanksgiving is my favorite holiday. You see… when I was 9 years old… my Grandma died. We were in Ohio preparing to celebrate Thanksgiving with our large extended family… when my parents got a call from my Grandpa, saying that my Grandma had died that morning in her sleep. My Grandma meant the world to me. Let me tell you a little bit about her. 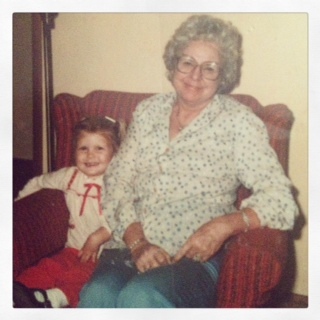 My Grandma was tall, her name was Betty (Elizabeth), or Moth (short for Mother). She smoked like a chimney… now that I look back. It seems like everyone did back then. She had a nice carrying case for her pack and lighter that matched her purse. She always wore slacks and open toe shoes. Even if they were heels. (I am the very same way. Open toe shoes all the way!) She wore make up from Merle Norman (I can still remember the scent) and clip on earrings. She use to take me to Diamonds every week as a little girl. Diamonds was a department store… later known as Dillards. We would shop for clothes and such… but most often for Barbies. I think we both had a bit of an addiction to Barbies. :) We’d also have lunch at The Gazebo. To a small child… the Gazebo was a fabulously fancy restaurant. I’m not sure if it really was or not. She drove a huge blue Buick, that we called Big Blue and I happily rode in the back to ballet lessons. She took me on trips, on flights. I slept in her bed and read with a flashlight under her sheets. She knew I loved to craft… so she kept a tub of supplies for me: pipe cleaners, google eyes, dixie cups, buttons, ribbon, glue… And she let me play in the kitchen too. She had a drawer full of Harlequin romance novels and another drawer full of my things in her room… costume jewelry, too-big-tee shirts, notepads full of doodles… I could go on and on. My Grandma was the world to me. Thanksgiving at her house was always a joy. So many aspects of that joy still speak to me today. We use her checkered table cloth and her plates. We use her emerald green water goblets. We use her very special butter noodle recipe… making extra so I can take some home with me. My 90 yr old Pop still attempts homemade cranberries… with my mom’s help these days. Family and friends still find their way to our table and I can still feel her presence every year. I can feel her right now, as I write this. I feel her often, in fact. And you can think I’m weirder than you already do… but I’ve reached her on my own with a medium friend. She’s here. With me. She loves me. A lot. And I love her a lot. Thanksgiving is my favorite holiday and it’s not about the food. It’s not about the football. And it may not even be about the friends and family. But it is about my Grandma. And how I’ll never forget the time I spent with her. So rather than mourn on this day… I choose to celebrate in my own little way. I’d love to hear some of you Thanksgiving memories in the comments below.